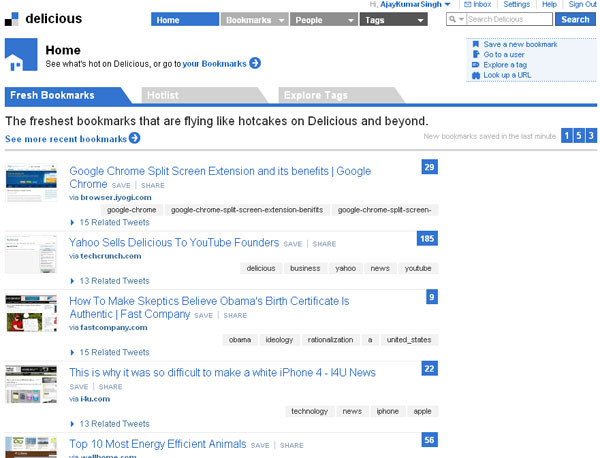 Delicious, one of the pioneers of social bookmarking, is changing hands again. YouTube founders Chad Hurley and Steve Chen will be the new owner of delicious. Delicious used to be the ultimate destination for social bookmarkers before Yahoo bought it and destroyed. Yahoo is really a sucker when it comes to bring downfall to many good portals. Recently it closed down MyBlogLog – a blogging directory after buying it. It seems folks at Yahoo need some lessons in Internet to understand what exactly users want. All you need to do now is to decouple Delicious from yahoo to it’s own account. After Yahoo acquired Delicious it was integrated with Yahoo system. Once you have moved the account you will receive a conformation e-mail. I’ve already transferred my account. Let’s see what the new owners have lined up for Delicious. I doubt that it will ever regain it’s old glory. Delicious is important from SEO perspective as links from Delicious are considered to be one of the over 200 signals which Google uses to rank websites. access to your existing bookmarks or account information. AVOS is a new Internet company founded by Chad Hurley and Steve Chen who, in 2005, founded YouTube, the world’s largest online video platform. Before YouTube, Hurley and Chen were early employees at PayPal, a leading online payment service that is now part of eBay. Delicious will become a part of AVOS, based in San Mateo, California. Learn more about moving your bookmarks. Thank you for using Delicious. Yahoo! has appreciated having you with us, and we are pleased to be able to transfer Delicious to an incredible new owner — you’re in good hands.